We ran across an interesting paper written by a Dr. Neville Jones with a whole alphabet soup of claimed credentials after his name. This review used to link to his copy of that article, but Dr. Jones seems to have removed the site. We regret being unable to let the reader see Dr. Jones' claims in his own words. Unfortunately his grasp of Apollo seems quite limited, as is his grasp of science. For someone claiming to hold advanced degrees in physics, he gets an awful lot wrong. We won't exhaustively examine the paper; just make a few comments. Dr. Jones is an avowed geocentrist, predicating that belief on his considerable devotion to his religious faith. While we respect matters of faith, we must treat scientific claims with proper scientific rigor. Dr. Jones gives ultimate authority to his religion and apparently presumes that the science "must" work itself out. As discussed in any good senior high school physics text ... the speed necessary in order to just escape the gravitation pull of the World, Vw, will be given by [the escape velocity equation]. Dr. Jones goes on to compute properly the escape velocity of Earth. But this is immaterial because escape velocity is irrelevant to orbital transfers, which is what he presumes to talk about in this section of his paper. You don't need to reach escape velocity in order to enter a transfer orbit, just the right velocity to bridge the two orbits. Apollo mission planners did not use high school physics texts to plan orbital transfers because those texts are insufficient. They used standard techniques in orbital mechanics such as those contained in Bate's Fundamentals of Astrodynamics, in chapter 7 of which the proper computations are given for translunar trajectories. Dr. Jones has taken a simplistic approach that is incompatible with his claims to expertise. He should know that there is much more to orbital mechanics than is covered in a high school text. From this analysis it is clear that ... safely landing on the Moon is impossible, given current technology, for either our rocket arrives just after the Moon (and can never catch it), or it arrives before and is smashed to pieces. These excerpts reveal considerable misunderstanding of how rockets are used to put spacecraft in orbits, and of what Apollo mission planners intended. First, the assumption that a given mission must expend all the vehicle's fuel is highly naive. Every rocket is provided with slightly more fuel than its mission requires, as a safety margin. In any event, the rocket is not compelled to burn all of it. The Saturn V was a sophisticated flying machine that was able to shut off its engine when the desired velocity was obtained, regardless of remaining fuel. Second, the Saturn V upper stage (S-IVB) provided the translunar injection maneuver and then was jettisoned. The crew used the SPS and RCS propulsion systems on the service module for mid-course corrections and other subsequent maneuvers. This is a well-known feature of Apollo missions of which Dr. Jones seems suspiciously unaware. Third, the scenario he proposes is a straw man. Dr. Jones does not argue that the rocket has insufficient power to get to the moon. He argues simply that it would either fall short or overshoot. And because his idea of mission planning is greatly oversimplified, he cannot consider the middle case of precise control that provides just enough velocity to get there without overshooting. He accepts that the rocket is sufficiently powerful, but neglects to consider that the pilot would just take his foot off the gas when the proper speed was reached. 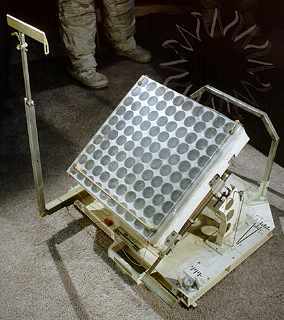 During Apollo 11, Armstrong and Aldrin are supposed to have deployed an 18-inch square piece of aluminum attached to a plinth, for the purpose of reflecting a laser beam directed at it back to the World. No. The LRRR was not merely a "piece of aluminum" but was instead an engineered assembly of corner-cube reflectors (Fig. 1). First of all, we assume that the laser beam reaches its target, 238,000 miles away, with the same beam width ... as it started out from the World-bound observatory with. An absurd assumption. No laser beam retains its emitted width over such a distance, as Dr. Jones should well know if his credentials are valid. This section of his paper argues that precisely aiming such a beam so as to strike a small target on the Moon is impossible, therefore it didn't happen. Unfortunately Dr. Jones has merely begged the question in his assumption; the beam in fact spreads to a diameter of about a kilometer by the time it reaches the Moon, making the needed aim less precise. The reflector must be precisely orthogonal, in both the x- and y-directions, to the plane of the observatory telescope exit pupil. That would be necessary if Dr. Jones had been right about the composition of the reflector. 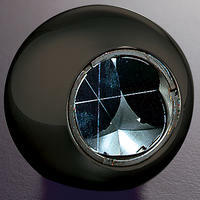 The corner cube reflector has the property that it reflects light precisely back in the direction from which it came, regardless of the angle of incidence upon the reflector. That notwithstanding, orthogonality to the incident beam is desirable because it maximizes the aspect of the reflector to its observer. But this is only an enhancement, not a requirement. Dr. Jones is correct in that his scenario would require impossible amounts of precision and control. However that scenario bears no resemblance to the behavior of laser beams nor to the design of the Apollo LRRR experiment. It is entirely a straw man. The next section of the paper is entitled "Miscellaneous Problems" and is a grab-bag of the standard conspiracy theorist arguments. Generally people with genuine credentials don't put any stock in these. The LM is fundamentally uncontrollable. ... Neil Armstrong was lucky to escape with his life when he was forced to eject just seconds into his one and only attempt to fly this thing on the World. No. See here and here. It would not be possible to survive the numerous solar flares which occurred during the Apollo missions without extremely large, heavy shielding. Only one mission, Apollo 16, suffered a solar flare, and it was a mild one. Solar weather is not a big secret; most observatories around the world record solar flares. Contrary to Dr. Jones' assertion, there were not "numerous solar flares" during the missions. The Russians had already determine that, to survive the radiation on the lunar surface would require lead suits at least a metre thick. No conspiracy theorist yet has been able to substantiate the claim that the Russians believed thick shielding would be necessary in order to walk on the moon. No reference for this is given, and in fact no conspiracy theorist has yet been able to substantiate this claim. The Russians acknowledged the authenticity of the Apollo missions, knowing full well the equipment that was provided. If they knew the "flimsy" Apollo suits wouldn't have protected the astronauts, why didn't they say anything at the time? They were quite happy gloating over the other American space attempts that failed. The doses of ionized [sic] radiation that the astronauts would have received during their passages through the Van Allen belts are far too high to survive. Dr. Van Allen himself disagrees. Prior to Apollo 11, no human or animal had been sent as far up as the start of even the lowest belt. Why does Dr. Jones identify Apollo 11 as the bellwether mission? The first Apollo mission to claim to have traversed the Van Allen belts was Apollo 8, not Apollo 11. This is not just a nit-pick. How much has Dr. Jones really researched Apollo? Further, Geminis 10 and 11 flew into the Van Allen belts. And on the Russian side, Zond 5 sent a number of biological samples around the Moon and back -- including two turtles -- and these specimens were recovered alive upon their return to Earth. Dr. Jones simply hasn't done his homework. The 'photographic record' is packed with errors and impossibilities. Dr. Jones doesn't go into detail here, but he has elsewhere. His concerns are all addressed here. The Hasselblad cameras had no exposure meter or viewfinder, yet the pictures were perfectly exposed and composed. It is possible to set exposure without an exposure meter. Photographers learn several rules of thumb that serve them in the field, such as the "sunny 16" rule. In the case of Apollo, exposure charts were printed on the magazine, detailing the settings to use for each photographic circumstance. In general the shutter speed was left at 1/250 second and the f-stop was set between f/5.6 and f/11 as needed for various lighting angles. Great care was taken to simplify the photographic operations. The pictures were not perfectly exposed and composed. Dr. Jones has likely only seen those that were chosen for publication elsewhere. Obviously the best photos will appear in those contexts. The webmaster had no problem using the Hasselblad MK70 (the modern successor to the EL/500 Data) with its viewfinder removed. The astronauts practiced for months to learn to frame pictures without the viewfinder, while the webmaster had only a few minutes to practice. The wide angle lens helped too -- the camera did not have to be precisely pointed. Anyone who has done studio photography will realize just how impossible a feat this would have been. Irrelevant. Documentary photography in the field is nothing like studio photography. In the studio everything is easier because you have precise control over all the variables. Commensurately, studio photography is more difficult because you have precise control over all the variables. Stated less flippantly, studio photography strives for high standards of photography excellence because those standards are achievable and expected in the highly-controlled environment. It would be more valid to compare Apollo photography to photojournalism, where the circumstances most certainly are not within the photographer's control. Techniques borrowed from this field such as zone focusing were employed in Apollo. And photojournalists are not bound by exposure meters or viewfinders. They manage to take some terrific photographs. There would be no 'photographic record' anyway, because the (Kodak Ektachrome) film type used was not protected from radiation, nor from (extreme) extremes of temperature. Fig. 3 -The lunar surface as photographed by the Soviet probe Luna 9. The Luna probes used film technology to photograph the lunar environs. The film was not damaged by radiation. Yet somehow the Russian photographic film survived (Fig 3). Contrary to Dr. Jones' belief, space outside the Van Allen belts is not universally awash in radiation. The Hasselblad film magazines were beefed with with thicker walls to protect against stray charged particles. That was sufficient. We discuss the temperature arguments here. It is acceptable that a layman may not understand the heat transfer principles that apply on the lunar surface, but it is utterly inexcusable for someone claiming to have a Ph.D. in physics to be so ignorant. The 'Lunar Rover' vehicle could not have been transported to the Moon inside the LM, even in a folded state. It wasn't. It was transported strapped to the side of the LM. Later in the paper Dr. Jones reveals he has taken some of his arguments from James Collier, who unfortunately made a serious error when considering the LRV stowage. Dr. Jones is apparently content to let Collier do his thinking for him; the stowage and deployment of the LRV was well-documented and presents no engineering impossibility. I believe that it is physically impossible to leave the LM through the exit hatch, wearing a pressurized space suit and bulky backpack. There is no way to cool the astronauts' space suits. This is absurd. We strongly question whether Dr. Jones really has the credentials he claims. The operation of a porous plate sublimator is based on very simple principles of thermodynamics. The metabolic heat from the astronaut's body is rejected via the principle of heat of sublimation, which, in subliming the ice on the device, draws heat from the suit coolant loop. James Collier has clearly demonstrated that footage of the 'Lunar Rover' was taken on the World. Collier has his theory, but unfortunately it is not based in physics. Collier argues that the "sudden" stop of the dust plume is because it hits air. Collier did not explain why, if this is due to atmosphere, it only works in the horizontal direction and not the vertical -- the dust falls smartly to the surface. Apparently an average domestic, programmable washing machine has more memory than the Apollo on-board computers were claimed to have had. Likely true, but irrelevant. A comet has no CPU or on-board memory, yet manages to pursue a stable orbit. See here for more information. There was insufficient power available to transmit radio and television broadcasts back to the World over such a distance. Ham operators have no problem believing the power levels. However, it must be acknowledged that the Apollo transmitters were indeed surprisingly weak. That's why the world's radio telescopes -- the most powerful receivers on the planet -- had to be employed to obtain the signals. Edwin Aldrin, when asked the straightforward question, "What is it like to walk on the Moon," has on several occasional broken down and left the room in tears. Ralph Rene, the source of this claim, details only one such occurrence, not "several". Dr. Jones seems unaware of the many occasions in recent times where Aldrin has spoken emphatically and assuredly about his missions for NASA. Aldrin's depression and alcoholism are behind him now, but at the time were something he -- like any other human being -- might have to deal with. Conspiracy theorists are forever reading motives into the behavior they observe in astronauts. How is that proof? We would argue that "What is it like to walk on the Moon?" is anything but a straightforward question. It's so broad and ambiguous as to defy a response. Neil Armstrong, to my knowledge, has never discussed it. Au contraire. He does not routinely discuss it with conspiracy theorists, for understandable reasons. But he gives interviews with authors and appears occasionally on television. Armstrong is a private man and has been since before becoming an astronaut. The authenticity of the Apollo space program is not embodied markedly in the personalities of one or two of its half-million participants. As we said above, we are beginning to question whether Dr. Jones really has the expertise he claims. It is clear he has done little if any actual research into the history and claims of Apollo. Likely he has let authors such as Ralph Rene and James Collier do all the thinking for him. That, of course, does not impugn Dr. Jones' academic degrees. But a PhD should know to check sources and verify claims from primary material. It is also clear that he has a tremendous religious fervor. This is laudable, as most people with strong religious principles seem to be well-grounded morally. But we question whether his faith has blinded him to the aspects of the science that granted him his degrees and which he professes to practice. But what we find most disturbing is his lack of understanding of rocketry and orbital mechanics, important topics to learn before criticizing Apollo from a position of knowledge and authority. And we wonder why his grasp of thermodynamics and heat transfer seems to be that of the layman instead of that of a highly-educated physicist. We have yet to meet a bona fide physicist who puts any stock whatsoever in the pseudo-science of Ralph Rene. Dr. Jones would be the first. We hope the above is not dismissed as mockery; it is not our intent to poke fun at Dr. Jones. But we have serious questions about his actual scientific expertise. It does not seem to match his claims to education.